Soup certainly doesn’t sound like any special life changing superfood. It’s soup, you’ve eaten it all your life. Yet soup has massive potential that often gets hidden behind nasty preservatives and less than ideal flavoring agents. The true beauty and nourishment happens with whole food ingredients and high quality homemade bone broth. This is where the magic happens. A daily soup made from local, seasonal ingredients and high-quality broth is better than any superfood or supplement out there. It’s a wholesome way to nourish your skin, immune system, joints, digestion and gut health. Homemade bone broth is rich in natural gelatin which is anti-aging and great for rebuilding damaged intestinal lining. Making bone broth from scratch is as easy as throwing your leftover chicken carcass in a large pot of water and letting it simmer for 24 hours. This gets all the good stuff out of the bones and into the liquid. Go to your local farmer’s market and get the freshest seasonal produce you can find. In the summer I love cooking fresh garlic, beets and carrot in a homemade stock and blending with fresh dill. Served cold on a hot day with a drizzle of plain yogurt, this soup is refreshingly tangy and packed with nutrients. In the Fall and Winter, soups made with root vegetables and hearty herbs like sage and rosemary are ideal. 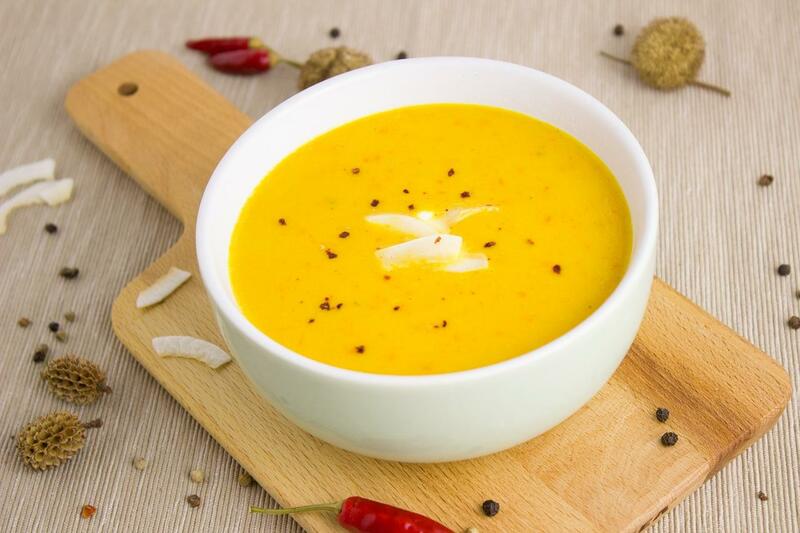 It’s all about sourcing local, pesticide-free vegetables for the most nutrient dense soups. Nothing you can buy from the store compares to what you can make at home with relatively little effort. The flavor base of every good soup should be sauteed onions, garlic and herbs. This is what all those flavor packs are trying to emulate. It doesn’t take long to cut up an onion and throw it in a hot pan with some olive oil, but it makes all the difference. This is one of my favorite soups. I could eat it every day, it’s so tasty and nutritious. A good soup does wonders for the body and soul. Soups offer a certain comfort that other foods lack. They’re also a vehicle for nutrient dense ingredients. Butternut squash is an excellent source of vitamin A and one of the healthiest starches you can get. It’s got a gentle sweetness to it which pairs well with a bold curry flavors and embraces the sweetness of apple. Apple and butternut squash naturally compliment each other. They’re harvested at the same time of year, they’re both high in fiber. When Fall comes around this is one of the first soups I whip up. It’s become a staple in my house and I hope you’ll enjoy it just as much. Heat oil in a large pot, add onions and garlic and simmer until golden. Add curry powder, salt, butternut squash and apple chunks and cover with chicken stock. Allow to simmer for about 30 minutes until butternut squash is soft. Use an immersion blender or add to your blender in batches to create a smooth creamy consistency, enjoy! Add all ingredients to your blender and process until super smooth.